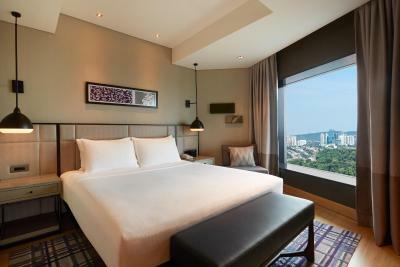 Lock in a great price for Hilton Kuala Lumpur – rated 8.8 by recent guests! The large gym with working equipments and the vast pool area. Next to KLIA. Room was nice and spacious. Check in and check out was fast and efficient. Staff are very helpful. Staff still tried to be helpful in difficult circumstances despite the obvious cost cutting and over booking efforts by senior management. 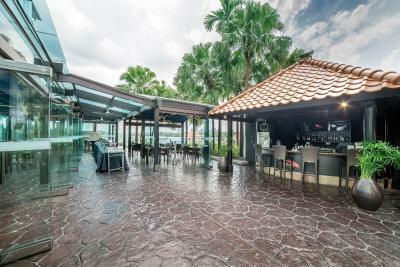 The location is very convenient, you can walk from KL Sentral without even stepping outside. The breakfast was ok. The Indian guy making Thosai was awesome! But the guy that did the eggs (yes, there's a guy solely responsible for cooking and frying eggs) must have had a real bad day. The scrambled egg was inedible, didn't even taste like egg at all. And the "soft boiled egg" was actually a miracle: the white part was still liquid and the yellow part was hard! I didn't even know this was physically possible. 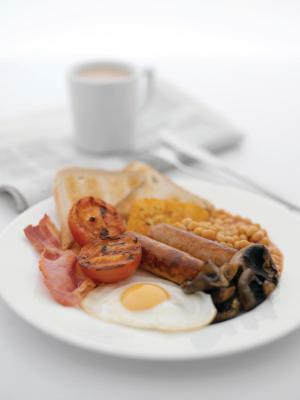 All in all the breakfast has a good selection though. 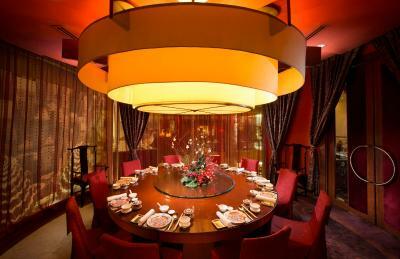 There are Indian, Chinese, Malay and continental options. The juices are on the sugary side, but I guess that's due to local preferences. 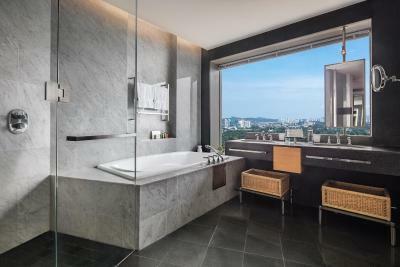 Hilton Kuala Lumpur This rating is a reflection of how the property compares to the industry standard when it comes to price, facilities and services available. It's based on a self-evaluation by the property. Use this rating to help choose your stay! 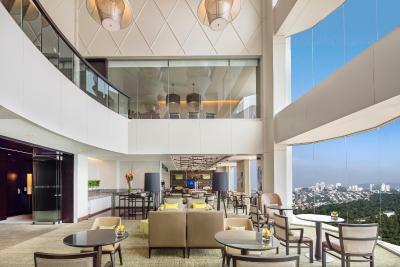 One of our top picks in Kuala Lumpur.Located opposite the National Museum, Hilton Kuala Lumpur offers accommodations in the heart of Kuala Lumpur's city center. 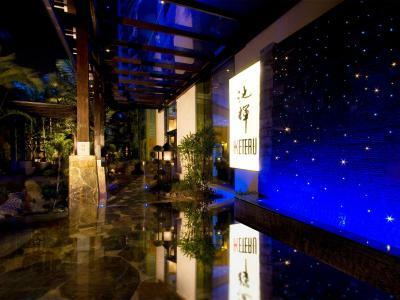 It features a freeform swimming pool and guests can enjoy meals from 10 of the in-house dining options or have a drink at the bar. Free WiFi is available in public areas. It is a 2-minute walk to KL Sentral. 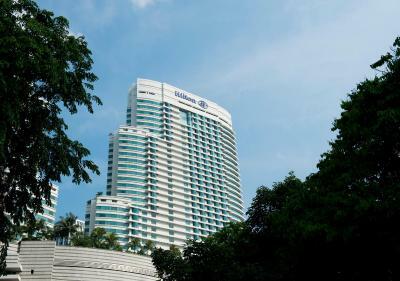 Hilton Kuala Lumpur is located 2,450 feet away from 9-story premium shopping mall, Nu Sentral. The hotel is a 15-minute drive from Lake Gardens. It is a 28-minute train ride by KLIA Ekspres from Kuala Lumpur International Airport to KL Sentral Station. Airport transfers are available at additional charges. 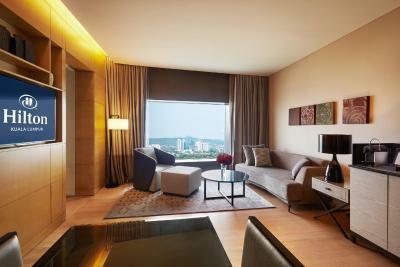 Modern rooms at Kuala Lumpur Hilton come generously equipped with large flat-screen TVs. Floor-to-ceiling windows offer full views of the city and lake. Luxurious marble bathrooms feature a rain shower. Executive Rooms and Suites offer Executive Lounge access. 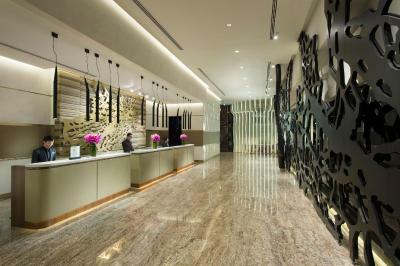 Guests can approach the 24-hour front desk for currency exchange, concierge services and luggage storage. Guests can join a yoga class at the 2-story fitness center or indulge in massage treatments at the in-house spa. 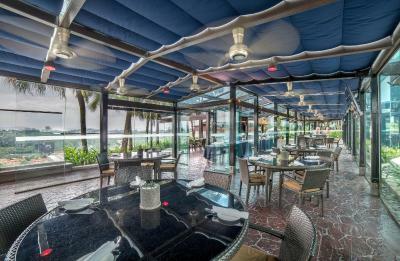 The all-day dining Vasco's Restaurant serves a selection of international and local dishes. 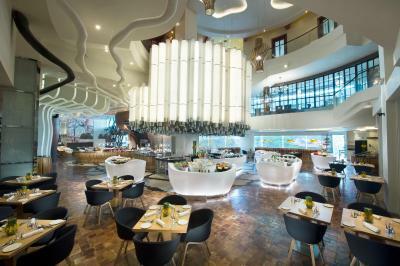 Modern European, fresh seafood and barbecue favorites are served at GRAZE and the other 4 restaurants. 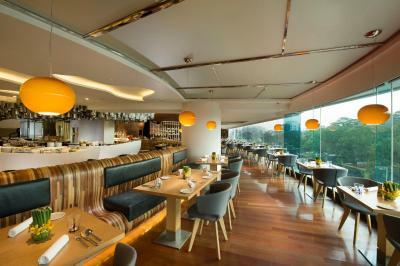 Drinks are available at Zeta Bar while delicious pastries, hot coffee and fresh breads can be enjoyed at the Oro Café. 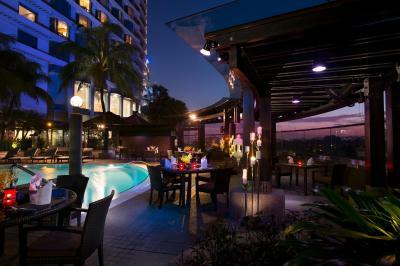 When would you like to stay at Hilton Kuala Lumpur? This air-conditioned contemporary-style twin room opens up to city views from floor-to-ceiling windows. It is fitted with a flat-screen satellite TV and a desk. Marble bathrooms include a rain shower, a hairdryer and free toiletries. This air-conditioned contemporary-style double room opens up to city views from floor-to-ceiling windows. It is fitted with a flat-screen satellite TV and a desk. Marble bathrooms include a rain shower, a hairdryer and free toiletries. Elegantly styled, this air-conditioned double room features city views and a separate working area with an ergonomic chair. It is fitted with a flat-screen satellite TV. The en suite marble bathroom includes a separate bathtub and shower. Guests enjoy access to the Executive Lounge. - Free-flow of tea and coffee throughout the day. Please note that the Executive Lounge has a minimum age requirement of 12 years and above, from 19:00 daily. Children of all ages are welcome in the Executive Lounge all day, before 19:00. 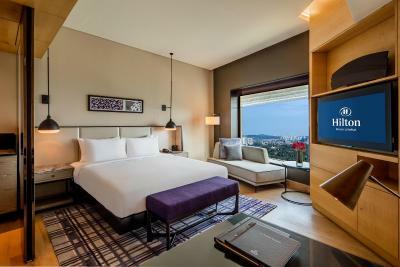 Overlooking the lake, this air-conditioned double room features a separate working area with an ergonomic chair. Flat-screen TVs are included in rooms, as well as in the large marble bathrooms. Elegantly styled, this air-conditioned double room features views of the lake and a separate working area with an ergonomic chair. It is fitted with a flat-screen satellite TV. 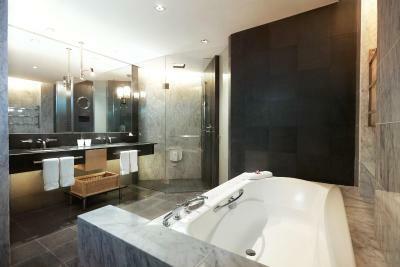 The en suite marble bathroom includes a separate bathtub and shower. Guests enjoy access to the Executive Lounge. Elegantly styled, this air-conditioned twin room features views of the lake and a separate working area with an ergonomic chair. It is fitted with a flat-screen satellite TV. The en suite marble bathroom includes a separate bathtub and shower. Guests enjoy access to the Executive Lounge. Elegantly styled, this air-conditioned twin room features views of the city and a separate working area with an ergonomic chair. It is fitted with a flat-screen satellite TV. The en suite marble bathroom includes a separate bathtub and shower. Guests enjoy access to the Executive Lounge. Overlooking the lake, this room features a separate working area with an ergonomic chair. Flat-screen TVs are included in rooms, as well as in the en suite marble bathroom. Elegantly styled, this air-conditioned double room has a separate working area with an ergonomic chair. It is fitted with a flat-screen satellite TV. The en suite marble bathroom includes a separate bathtub and shower. Guests enjoy access to the Executive Lounge. Overlooking the lake, this room features a separate working area with an ergonomic chair. 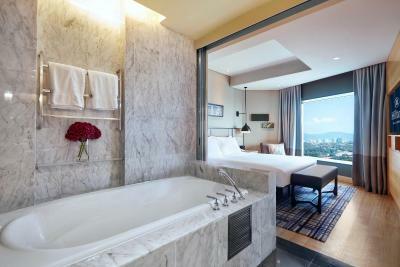 Flat-screen TVs are included in rooms, as well as in the large marble bathrooms. Elegantly styled, this air-conditioned twin room opens up to views of the city and has a separate working area with an ergonomic chair. It is fitted with a flat-screen satellite TV. The en suite marble bathroom includes a separate bathtub and shower. Guests enjoy access to the Executive Lounge. 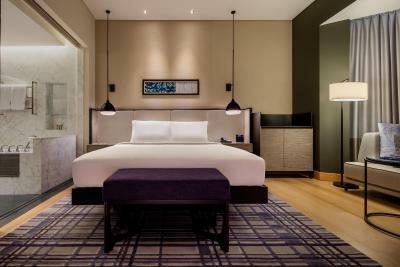 This air-conditioned contemporary-style twin room features floor-to-ceiling windows. It is fitted with a flat-screen satellite TV and a desk. 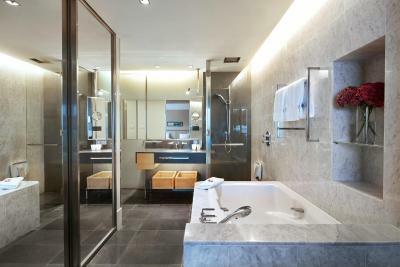 Marble bathrooms include a rain shower, a hairdryer and free toiletries. This air-conditioned suite opens up to panoramic views of Lake Gardens from floor-to-ceiling windows. It has a separate living room, a dining area and 2 flat-screen TVs with a home theater system. A nespresso machine is included. Guests enjoy access to the Executive Lounge. This room type can accommodate 3 adults. This air-conditioned suite features a separate living room fitted with a large flat-screen cable TV. 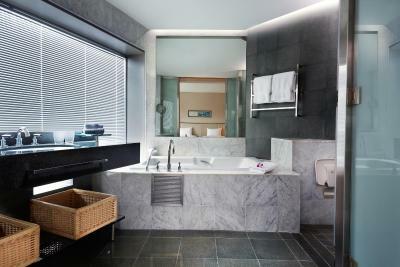 The en suite marble bathroom includes a rain shower, a hairdryer and free toiletries. A Nespresso machine is included. 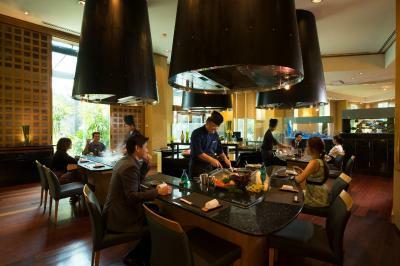 Hilton Kuala Lumpur is 28 minutes from the international airport via direct high speed train. 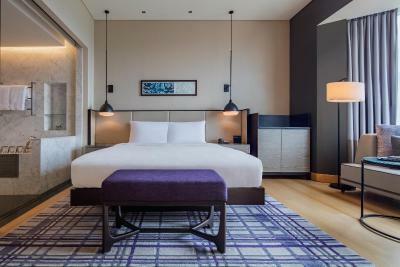 Guestrooms and suites boast panoramic views of the KL Lake Gardens and sumptuously furnished with unique open plan residential design featuring luxurious native timbers, South-Asian fabrics, Italian stone and discrete technology. Executive rooms and suites include access to the Executive Lounge with a personalised service, stunning views and extensive local and international cuisines served throughout the day. 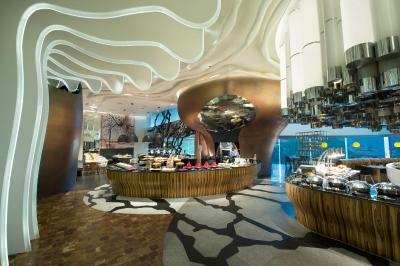 The hotel features 10 award winning restaurants and bars, spa, 24-hour gym, freeform pool and 14 event spaces. 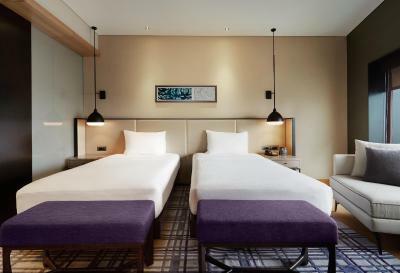 Adjacent to the Nu Sentral mall, this hotel is a destination in itself. WiFi is available in the hotel rooms and costs MYR 29 per 24 hours. 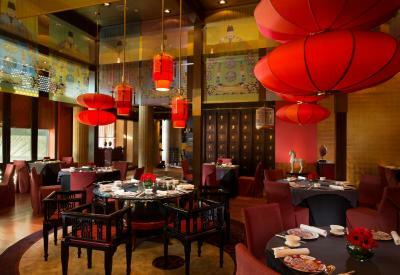 House Rules Hilton Kuala Lumpur takes special requests – add in the next step! Hilton Kuala Lumpur accepts these cards and reserves the right to temporarily hold an amount prior to arrival. The location of the Hilton lobby might be confusing to some drivers. Also, some rooms are smaller than others. Be sure to insist on normal size rooms and square shaped rooms that are not affected by the curveedge layout. We arrived early for check-in at abt 1pm but were inform can only collect the room card at 3pm which we understood. At 3pm we came, unfortunately only 1 room is ready which is my teenage kids room. I only got my room at 3.45pm after a 3rd call which make me very upset. Never had such experience in other hotel. We have a tiring flight and wanted to have a rest instead I was very upset on my 1st day. For those arriving KL on flight, it is the most convenient location you can get as it is just few minutes walk away from airport express train station. 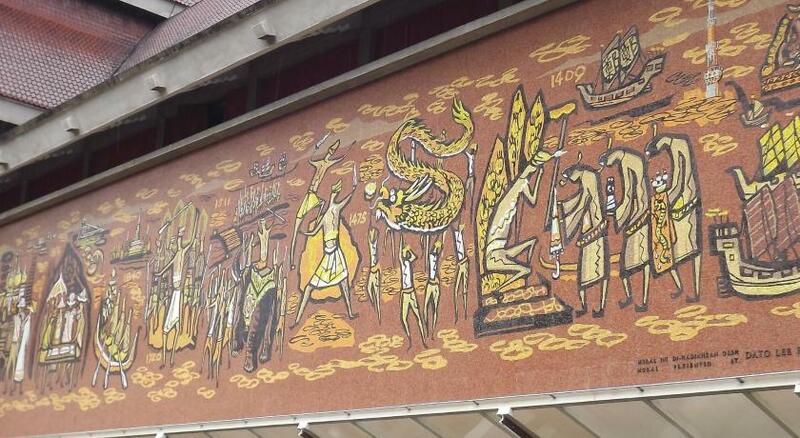 It located in central of the town, slightly away from touristic bukit bintang, yet surrounded all you will need: shopping mall, restaurants, indian food, etc. 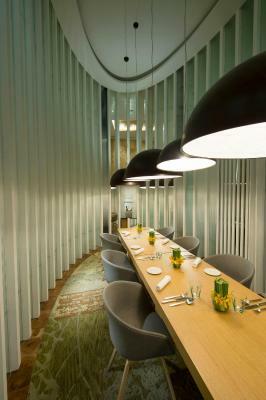 Room are spacious and have a very modern and elegant interior design. Staffs are very professional and helpful. Some of the fixtures in the room are aged and prone to break. Ordered mee goreng mamak, kway teow goreng and sate. Sate is recommended but not the mee goreng and kway teow. Staff were all extremely friendly, Jaspal Singh (doorman) was a really nice guy! Great location just across from KL Sentral, spacious room, loved the bath room. Clean and comfortable. The staffs are friendly and helpful. If you go to KL, this is the hotel to stay. Awesome breakfast. Excellent access to Sentral station Enormous 2metre wide bed. Super friendly welcome from all staff. Next to 1 shopping complex. Next to airport express train station.